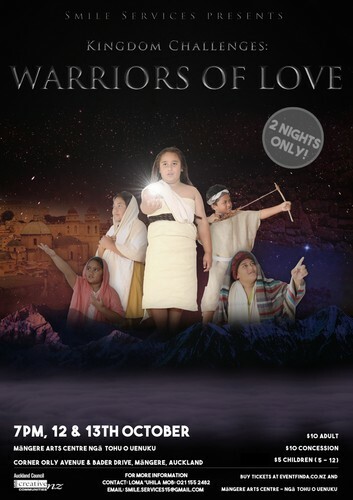 Bring the whole church and village this school holidays to see a theatrical integration of your favourite Sunday school stories featuring Warriors of Love accompanied by an angelical choir and live band. Now on its fourth season, we challenge you to join us in this Epic, cultural, diverse, funny yet purposeful adventure of our story of hope. Haere Mai, Me'a Mai bring the whole family for there is plenty of room in Noah's Ark, don't forget the door shuts at 7.15pm.